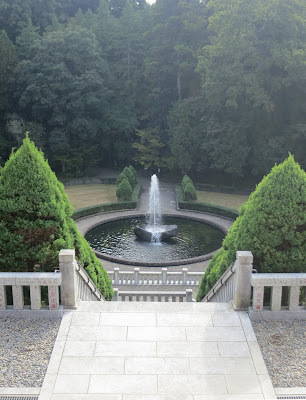 From my last trip: a small and not very typical part of the gardens in Narita Temple. Come to think of it, it strikes me that this bit of garden design is in the European style. I was actually strict about sticking to my one hour of planning today, so this is a good indication of what really fits into hour. I wanted to sort some minor details of planning so that I wouldn't have to waste time on them when I actually get to Japan. Remember - an hour spent in advance equals at least an hour during the actual trip. I would rather spend the time looking at nice things. I figured out where to go in Narita Airport to get my JR East rail pass turned on. I marked the location of both the car rental places on Google Maps - I have the vouchers for the two car rentals already, but I don't expect to get the translated driving license that will allow me to use them for over a month! Since we're going to be staying on the coast at Ajigasawa, I knew it would be to my advantage to find a beach in advance. I have a feeling it may be expected of me! (Antonia... beaches...). This is the advantage of research: my first instinct was that the beach a short drive out of town would be nicer, but I learned it is typically covered with trash. Ajigasawa Beach Resort, right in town, is probably better maintained, and walking distance from our hotel. I started studying Hiraizumi, the World Heritage Site in which we'll be spending a single day. We won't have time to do everything comfortably unless we rent bikes. I daresay that's why there are multiple bike rental places near the station. We may just minimize and NOT try to do everything as this is often a better bet with Antonia anyway. Also she can sort of ride a bike, but not especially well, and we would be on roads. NOTE TO SELF: Take Antonia to the park before we go so she can relearn to ride a bike anyway!! !